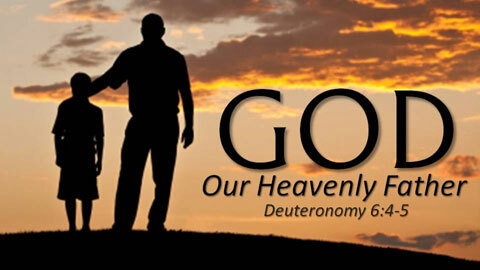 Did you know that “our God and Father” is the exact same “God and Father of our Lord Jesus Christ”? 1 Peter 1:3 (RSV) “Blessed be the God and Father of our Lord Jesus Christ! By his great mercy we have been born anew to a living hope through the resurrection of Jesus Christ from the dead." 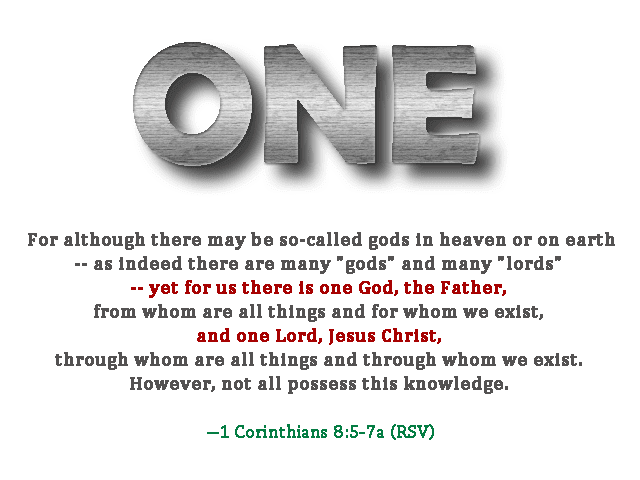 The doctrine of the Trinity expresses a belief in one God who exists in three distinct, but equal, persons. In light of the biblical text just given, this cannot possibly be an accurate teaching (doctrine). There can be no "equality" between the Son and the Father. It is right and accurate to say that the Father and Son share the same nature, viz. Jesus is like God, but they are not equals. If they were equals, then the Father would not [could not] be the God of the Son. In fact, there could be no Father/Son relationship if they were equals. A father is a father and a son is a son. The son comes from the seed of the father. In fact, Jesus himself said, “I live because of the Father” (John 6:57 RSV). God is not dependent upon anyone or anything; He is fully, self-existent. Jesus said, “I live because of the Father.” Jesus was fully dependent upon God. Jn 5:19— Jesus said to them, “Truly, truly, I say to you, the Son can do nothing of his own accord, but only what he sees the Father doing; for whatever he does, that the Son does likewise. Jn 5:30— “I can do nothing on my own authority; as I hear, I judge; and my judgment is just, because I seek not my own will but the will of him who sent me. Jn 12:49— For I have not spoken on my own authority; the Father who sent me has himself given me commandment what to say and what to speak. Jn 14:10— Do you not believe that I am in the Father and the Father is in me? The words that I say to you I do not speak on my own authority; but the Father who dwells in me does his works. Some might say, but Jesus said, “I and the Father are one” (John 10:30 RSV) True. 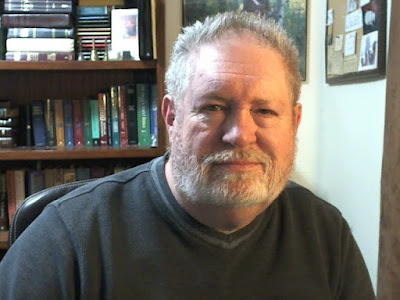 But Jesus also said, “In that day you will know that I am in my Father, and you in me, and I in you” (John 14:20 RSV) AND “The glory which thou hast given me I have given to them, that they may be one even as we are one” (John 17:22 RSV). 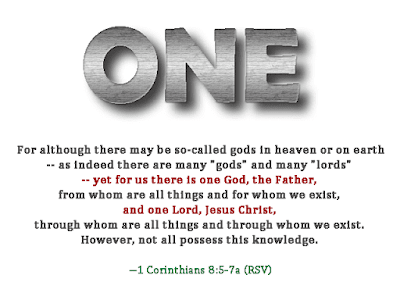 Being ‘one’ in the sense that Jesus means, does not make him “equal” with God, anymore than our being ‘one’ with Jesus makes us “equal” with Jesus. There would be nothing to GIVE Jesus if he was “fully God”. Ephesians 4:1-6 (RSV) 1 I therefore, a prisoner for the Lord, beg you to lead a life worthy of the calling to which you have been called, 2 with all lowliness and meekness, with patience, forbearing one another in love, 3 eager to maintain the unity of the Spirit in the bond of peace. 4 There is one body and one Spirit, just as you were called to the one hope that belongs to your call, 5 one Lord, one faith, one baptism, 6one God and Father of us all, who is above all and through all and in all. Is there anything that ALL does not include? If you have any doubts about the word ALL, look it up in the dictionary.